A woman who alleges she was sexually harassed at Fox News has asked UK media regulators to block 21st Century Fox's planned purchase of Sky. Ofcom is examining the £11.7bn bid for the UK broadcaster. Wendy Walsh's legal team says the deal would allow Fox to bring a "culture of sexual and racial harassment" to the UK. The company said it has addressed the allegations and made fundamental changes. The British media regulator, Ofcom, is examining whether it is in the public interest for the Murdoch-owned company to take full ownership of Sky, of which it already owns 39%. A previous bid from the Murdochs to buy Sky was abandoned after a scandal over phone hacking at Murdoch-owned newspapers. Amol Rajan: Is Rupert Murdoch worried? The Murdoch-owned firm 21st Century Fox said its management has taken "prompt and decisive action to address reports of sexual harassment and workplace issues at Fox News". Three of Fox News' most senior male staff have recently left the company following accusations of sexual harassment and mismanagement. "These actions have led to an overhaul of Fox News Channel's leadership, management and reporting structure, and have driven fundamental changes to the channel's on-air talent and primetime programming line-up." But Dr Walsh - who was a guest on The O'Reilly Factor - and her lawyer, Lisa Bloom, who represents four women who say they were sexually harassed or discriminated against at 21st Century Fox, argue that Fox should not be allowed to succeed in its bid for Sky. Ms Bloom said "there is an epidemic of sexual harassment and retaliation" at the firm. "It's phone hacking part two" she said. 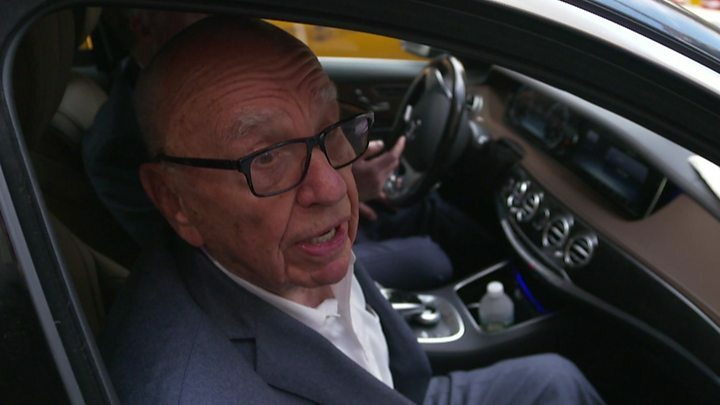 When approached in New York by the BBC, Rupert Murdoch said he was not concerned about events at Fox. "There's nothing going on at Fox News," he said. "Fox News is getting record ratings ... so I'm not worried at all". Former Fox news anchor Bill O'Reilly and the network's chief executive Roger Ailes have both left the company, following allegations of sexual and racial harassment, which they deny. The company's co-president, Bill Shine, has also left. He is not accused of harassment. Ofcom is examining the proposed takeover of Sky by 21st Century Fox in the light of media plurality and broadcasting standards. Part of Ofcom's investigation will include whether Sky's potential new owners are "fit and proper". European competition authorities have already waved the deal through. Both Sky and Fox are controlled by businessman Rupert Murdoch, who also owns the Times and the Sun newspapers.